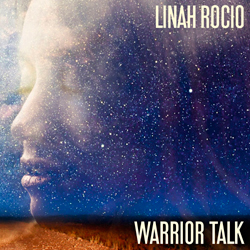 We’re really stretching the boundaries of Americana UK with Chilean born, Swiss based Linah Rocio’s latest album. OK, there’s a banjo to be heard on the second last song here, Megan although it struggles to be heard over the inventive percussion, dextrous double bass and roomy piano that clothe the song. Rocio describes artists such as PJ Harvey and Joan As Policewoman as her heroes and as such she fits within the set of strong willed singer/songwriters who are pushing the envelope with their music, rock, jazz and traces of the avant-garde all part of the experience. There are songs which sound like Laura Nyro fronting a gnarly punked up Steely Dan as on Everything while Simon Rupp on guitar sounds at times like Marc Ribot. The album’s not an easy listen, the lyrics dark at times especially on the gossamer voiced Elisabeth which addresses infertility. Rocio delves into what she describes as her “fragilty” throughout the album. LA or New York was written in the aftermath of a marriage breakup and The Right Soil is a noirish creep into the workings of depression with the band rumbling along like an early version of The Bad Seeds. There’s a tribute to Amy Whitehouse on Amy Jade that’s delivered with a sleek finger popping jazz groove and the title track is a rollercoaster of a song oscillating between delicate piano ballad and full throated percussive drive. It’s not Americana but Ms. Rocio is following in the footsteps of Joni Mitchell and Laura Nyro with the adventurous spirit of Tom Waits and Nick Cave so if that’s your bag do have a listen.